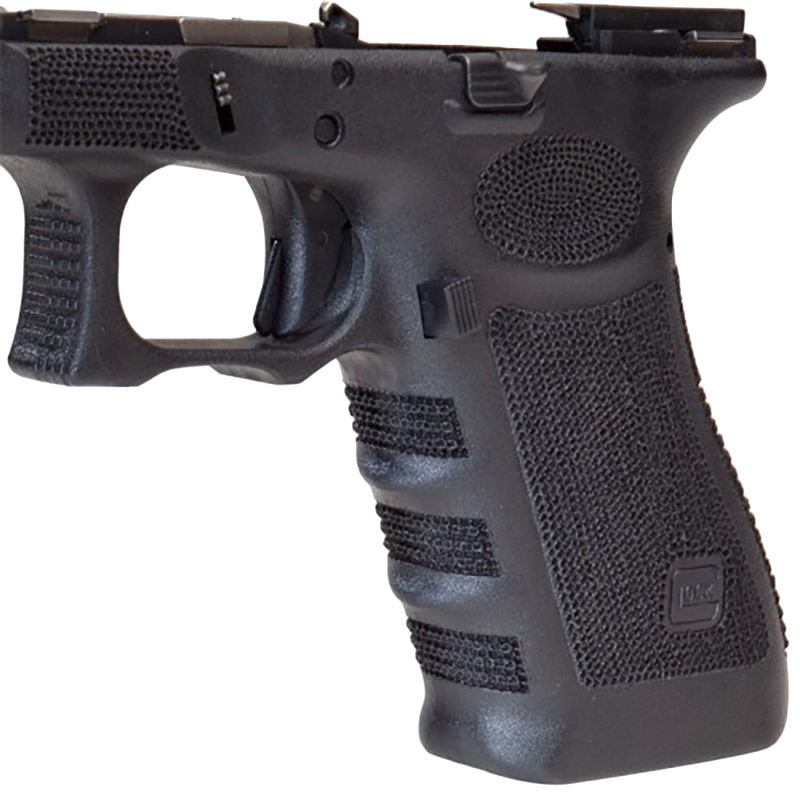 Stippled Grip for your Glock alters your frame permanently and makes your grip extremely tacky so that it stays put in your hand under even the most humid conditions. Custom Stippling Available upon request. Please email dludwig@glockstore.com for design and pricing inquiries. This new technique will give your Glock a unique look and absolutely best grip you have ever experienced. You'll never have your Glock slip in your hand again. It is far superior to slip on grips and stick on grips; however, it does alter the frame forever. Our craftsmen actually emboss a stippled pattern into your Glock's frame. This alters your frame permanently and makes your grip extremely tacky so that it stays put in your hand under even the most humid conditions. To order, take the upper portion of your Glock off the frame and send the lower portion only (the frame) in for stippling. Applies to all model Glock handguns and Springfield XD handguns. Starting at $85 based on coverage and texture. Accessories (Backstraps, Magazine Extensions, etc.) not included in this price. These items can be stippled for a small extra fee. Please Note: If your customization order involves an entire gun, or gun frame, you will be charged our standard $40 Fedex Overnight Firearm Shipping Rate for the return of the weapon to your specified address. Lead times may vary based on current custom orders. Please contact our custom shop for current timeframes. NOTE: ALL CUSTOM GUN WORK DOES NOT QUALIFY FOR ANY DISCOUNTS. I just received my G42 and G43 back from the Glock Store. Absolutely fantastic art work - none better. This will make your Glock stand apart from the rest of the field.